-This Fashion Design and Unique Dress Will Be Your Favorite When You Get It. -It Features a Flared Sleeve, and Pockets on Each Side for a Relaxed and Practical Look! -in the House/Beach/Date/Daily Life/Evening Party/Wedding/for any Season. These are the Reasons Why You Possess It! 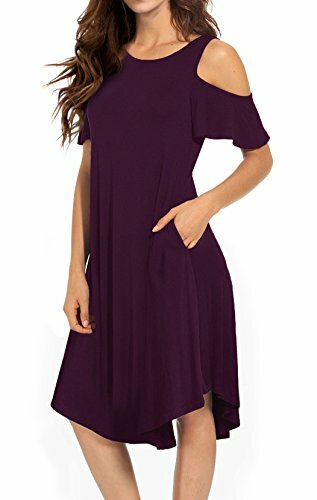 -S (US 4-6): Bust 32"--Dress Length 41"--Sleeve Length 5.87"
-M (US 8-10)): Bust 34"--Dress Length 41.3"--Sleeve Length 6.12"
-L (US 12-14): Bust 37"--Dress Length 42.1"--Sleeve Length 6.37"
-XL (US 16-18): Bust 39"--Dress Length 42.5"--Sleeve Length 6.62"
PS:This is Pockets Dress Size. PS:This Size Information Is Just For Reference Only, Please Allow 1-2cm (0.4-0.8") Differences Due To Manual Measurement. If you have any questions about this product by VERABENDI, contact us by completing and submitting the form below. If you are looking for a specif part number, please include it with your message.